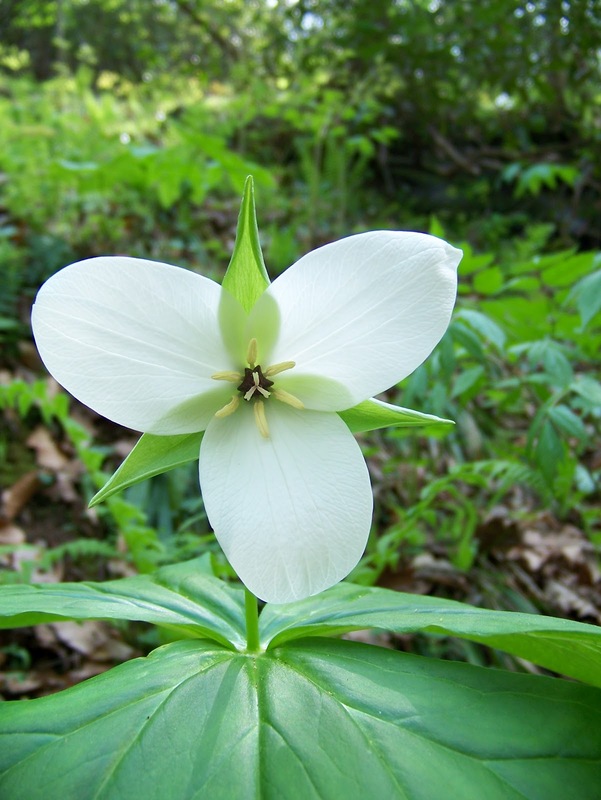 Any of various plants of the genus Trillium, of North America, the Himalaya Mountains, and eastern Asia, usually having a cluster of three leaves and a variously colored, three-petaled flower. 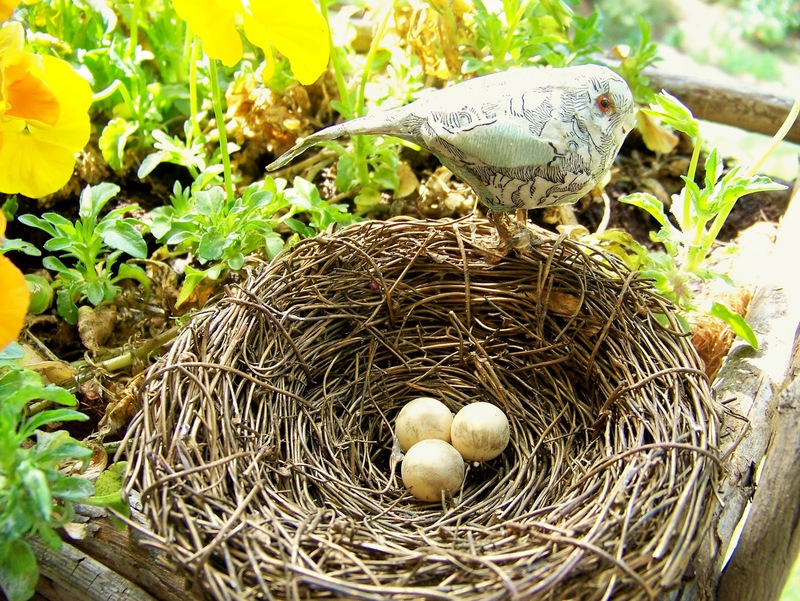 Also called birthroot, wake-robin. Create a scrapbook page, card, home decor item, or other project with a Springtime theme. 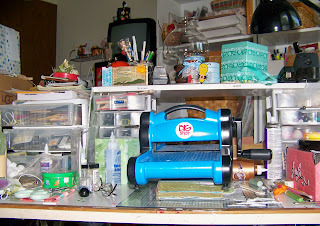 You must also incorporate ric rac and at least one sticker, and include at least 2 Cricut Image Cuts. Sometimes there are advantages to living in an apartment. 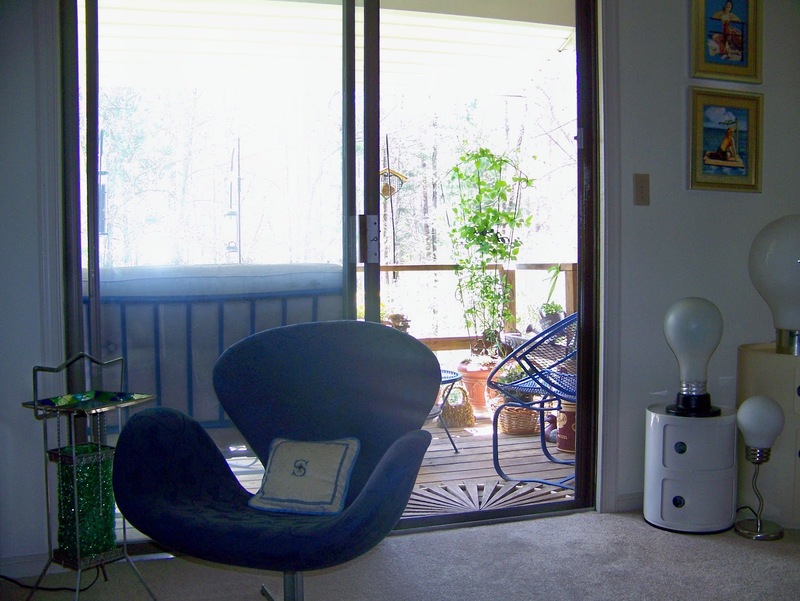 For me, it's the fact that I have an enclosed stairway so I can create my paper crafts to hang on my front door without having to worry about nature destroying them. 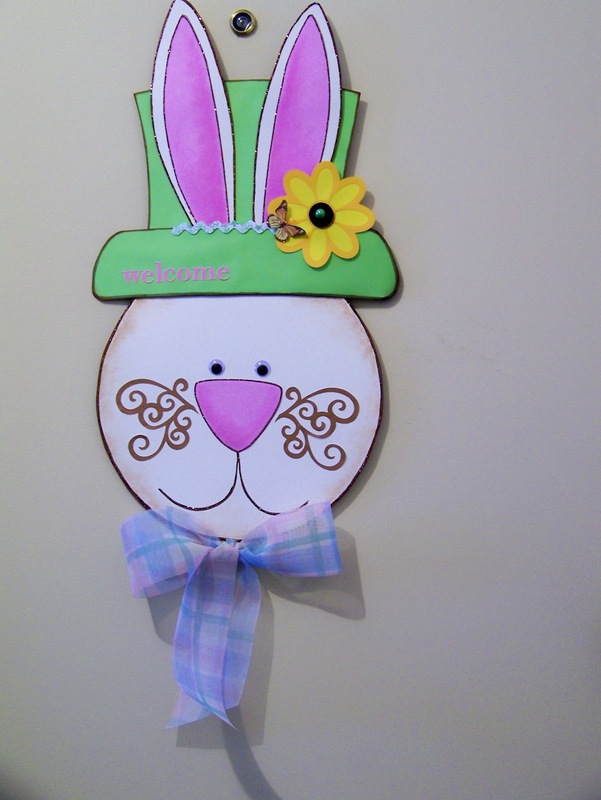 So I made a huge bunny head as my welcome Easter door decoration! 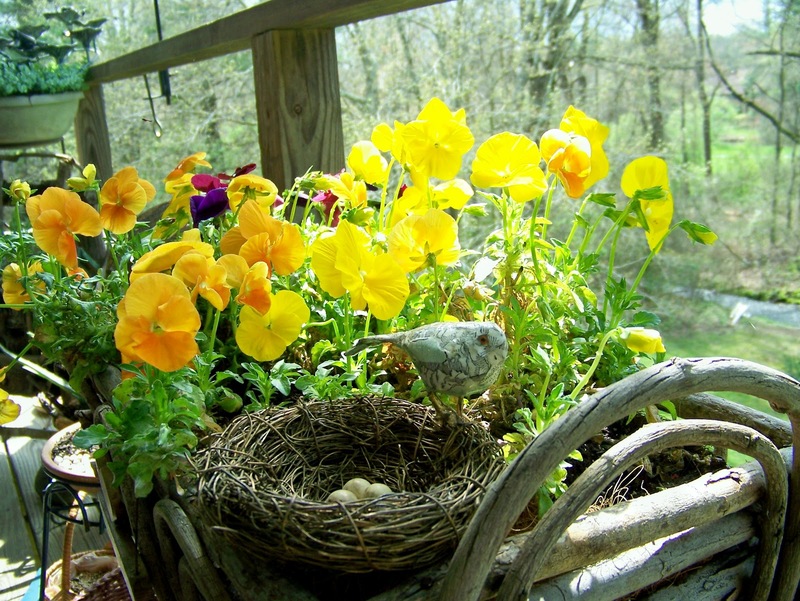 Weekly Challenge #55: Springtime Challenge! butterfly sticker, gem - K&Co. ...and leaving you with a picture of a Trillium I took yesterday while on my hike. Just love all the wild mountain flowers blooming right now! Lovely day outside! Think I'll go sit on my balcony for awhile! 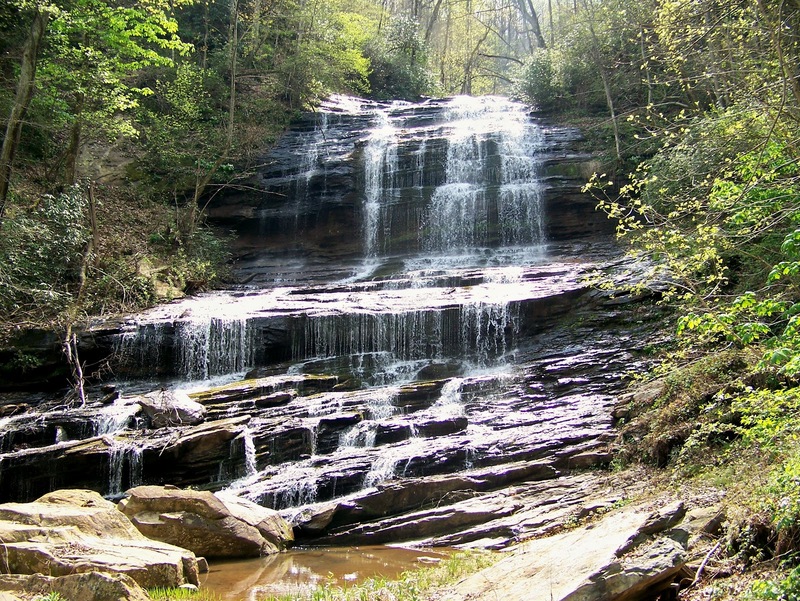 Spent yesterday hiking one of the cutest trails ever, very scenic and not a very hard hike either, so everyone had a good time. I hope y'all have a fantastic week end spend it doing whatever it is that you enjoy! 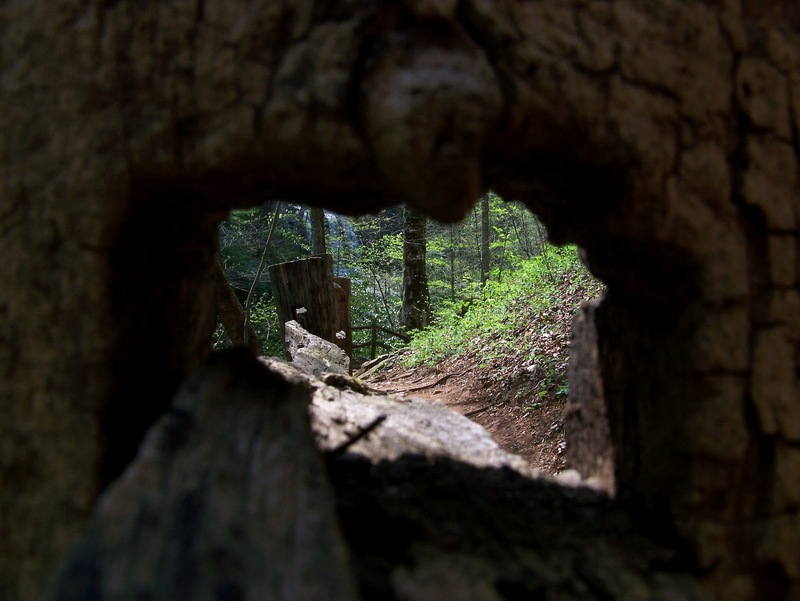 This way your camera is focusing on what's in the distance and not trying to focus on the wood that right up to your camera lens. 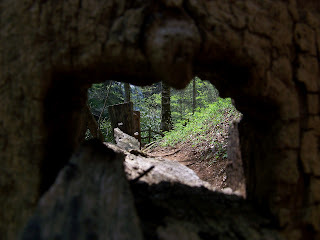 I could have darkened the wood out completey in photoshop but I actually like seeing what your looking through. 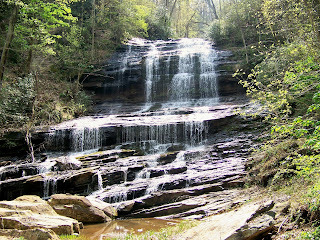 And the waterfall that was our destination. Hi everyone! As you read this I will be hiking Pearson's Falls, but I wanted to leave you a close up of what was on my desk yesterday. I received a lot of comments on it, and thank you! It means so much when someone leaves a kind word for you! It's a take off on lesson #4, from Elizabeth's Altered Book Lover class. 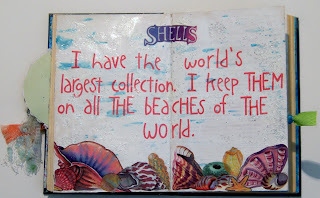 I had some shell stickers that I loved, actually several sheets of them, lol, so I got to use up a whole sheet, which made me feel good to use up some of my stash! 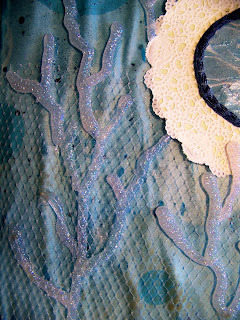 The background is gesso ( 2 coats ), then a couple drops of glimmer mists spread out, then sprinkled with coarse glitter, and lightly brushed over with a third layer of gesso. Then I simply layered the stickers along the bottom and the title on the top. I then added my sticker letters. Now afraid things wouldn't stay stuck I then put a layer of clear coat on top of that. And then a dusting of fine glitter over everything. 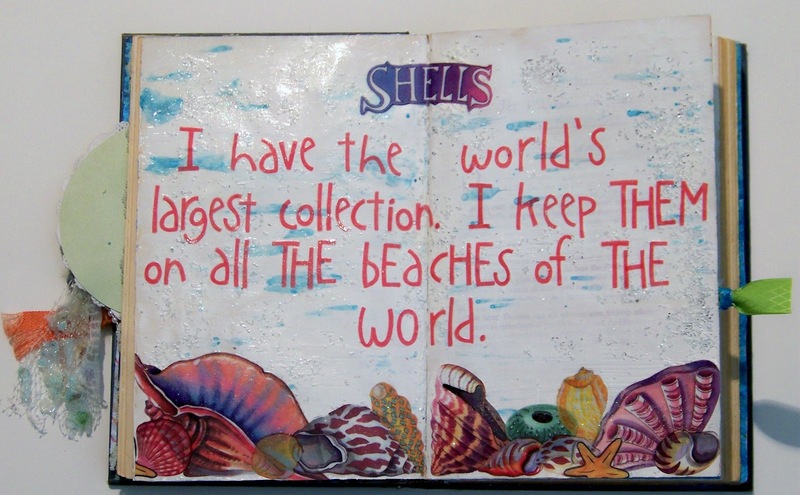 "I have the worlds largest seashell collection. You may have seen it, I keep it spread out on beaches all over the world." A question here, I normally write the author of the quote when I use them, but since I changed it, what do I do? Would love some suggestions! Please! It's Wednesday, and what does that mean? it's WOYWW...which means means 'what's on your workdesk Wednesday'! and what's on mine, you ask? did you ask? My altered book and the current pages I am working on! That's whats on my desk and all the stuff that goes with it ! 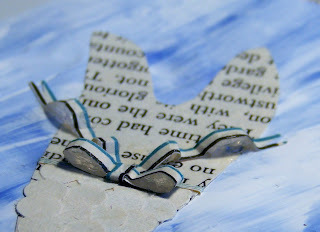 I am just having a world of fun with this project and would love for y'all to join us over at Altered Book Lover where we are on lesson #4, and if you want to see every one's progress, their links are at the bottom of Elizabeth's post! 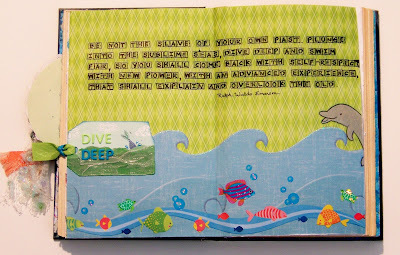 Elizabeth over at Altered Book Lover gave us some assignments this week and I really enjoyed this one. 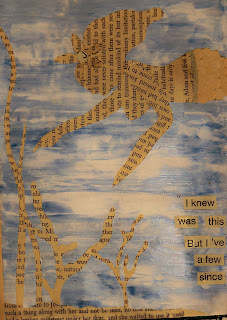 All my elements on this page came from the pages I had torn out when "thinning" the book. I FREEHAND cut EVERYTHING...lol...can you tell I impressed myself? It's been hard to not add pen, ink, stickles...I'm not kidding you, but I wanted this page to have a unique twist to it. I like the design incorporating the pages of the book itself. The only pen used are the quotation marks and the author of the quote. 4. 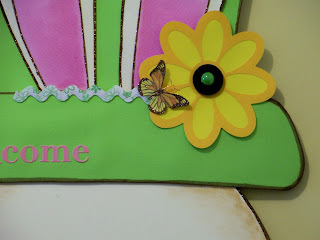 Create a double page spread using gesso as both the background AND the glue to which you will add your page elements and embellishments. 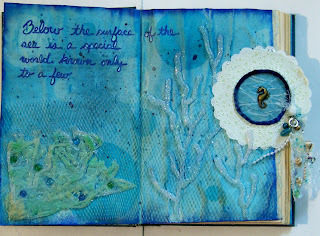 I first spread the gesso on the page, let it dry and then applied the second layer, while it was still wet I add some drops of blue paint and then using my spreader to mix it into the gesso. I had precut my sea weed and coral beforehand and had a dry run for the placement of everything so I was able to lay them directly onto the wet gesso. 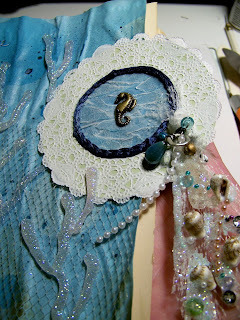 The coral is the only element that I used the gesso as glue, everything else was glued down with Helmars Acid free Glue. The small bow on her tail and the flower in her hair are supported by Helmar's Liquid Scrapdots, so they will not get flattened. One of my all time favorite glues. This page has been weighted down ( after it was dry ) by my Big Shot, just to show you how well these delicate pieces are staying dimensional! Now Ms. Julia wants us to keep it short, and I failed miserably but then you can't expect a girl to behave every week.....can you? 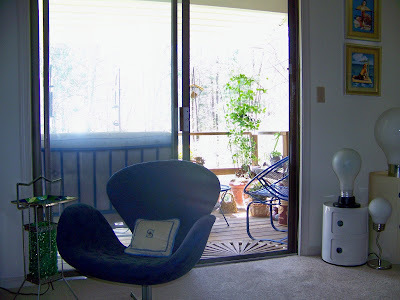 Ok, now this is where I'll be sitting with my laptop while visiting your blogs. ahhh this is the life! Saving the best for last! 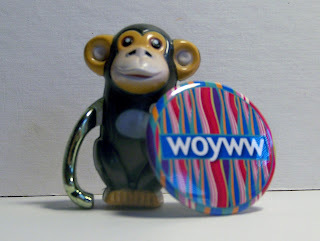 I got my WOYWW button in the mail yesterday and little monkey mojo is proudly displaying it! Thank you Julia, you are too sweet to do this! 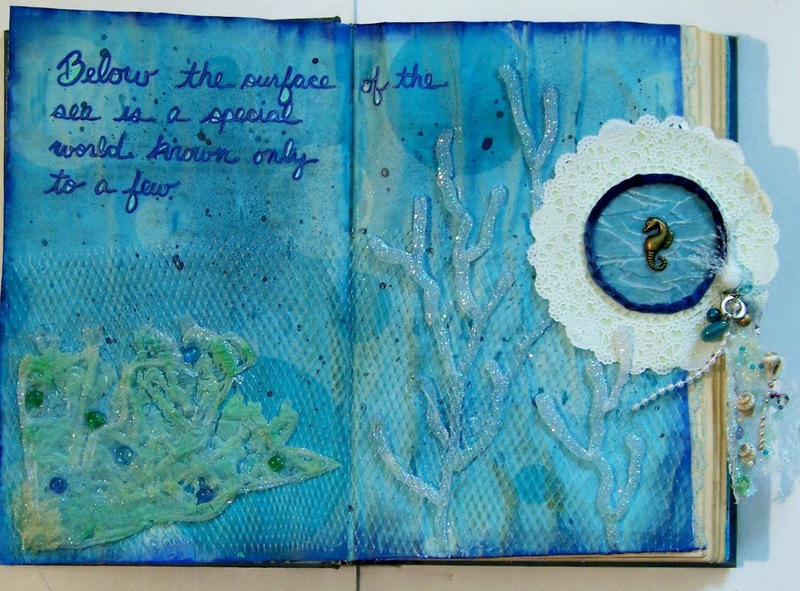 A short post today, another 2 page spread for my Mermaid AB. I am really enjoying the class over at Elizabeth's Altered Book Lover, and if you have ever wanted to make an AB, she has great instructions and the class is free! Awesome, right? Well, must run some errands, it's a bit chilly today, back to long pants and long sleeve shirts, no sandals today! 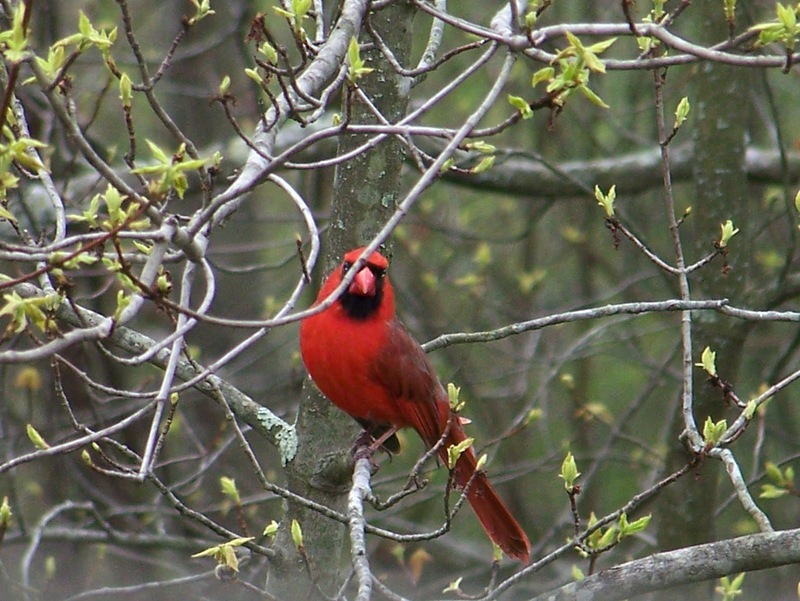 Spring is hard on a girls wardrobe! 2. 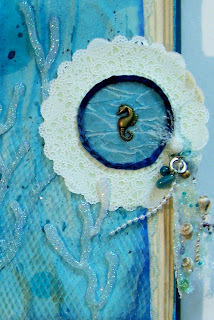 Create one double glued page using gesso. Document how it behaved when you worked with it. Now I guess it might be considered cheating, but I knew the results I would get as I use vellum quite a bit and know that any wet glue will make the vellum curl and wrinkle. BUT I was planning an underwater scene so I used it to achieve that wavy watery feel. So with confidence I applied my gesso and laid down the vellum sheet to be adhered. 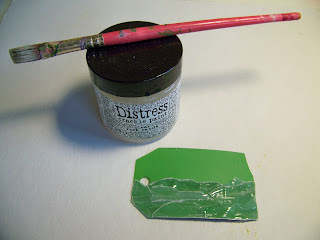 "If your pages warp and you can no longer place a weight over the closed book, simply cover the back side of your page with a thin layer of gesso. That may not eliminate the warp, but it will decrease it a great deal." So I applied a thin coat of gesso to the next page, plus a piece of lace to the edge to hide the shrinkage and "glued" the next page to the back of the shrunk page. It did help to smooth it out some and I was again pleased with the results. Thanks Elizabeth for that tip! So yes, I did learn a new technique when you have a real wrinkly page and you want to smooth it out a little. So, a smarty pants like me still learned something, even though going into this page I thought I knew what the results would be. 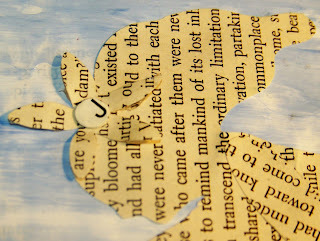 I am going to try and make Sunday a day that I show what I have made from being inspired by Pinterest. I love the ideas I have been getting there, so much fun goodness to share with everyone! 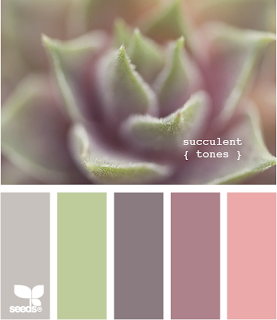 I have been working this 'succulent' color palette into some elements on my back porch. 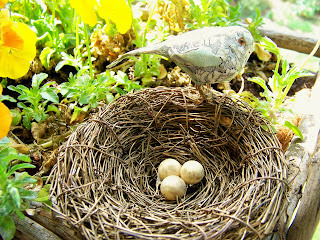 It comes from Design Seeds, and when pinning or blogging, always, always try and give credit to whence it came from! For my project I also got an excellent idea from this pin, no source given :( What I liked from this picture was the title they added to the binding. So from those, came this, which I am going to use on my back porch, under a potted plant. 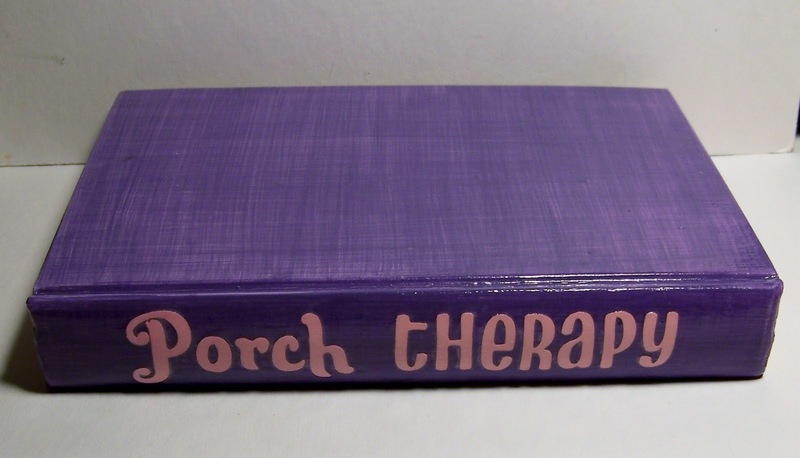 I love my porch and it is definitely my "happy place", so hence the title. 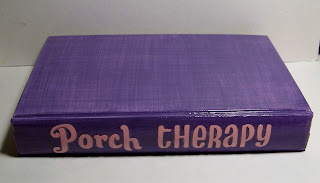 I sealed it up, gesso'd and painted it like Elizabeth taught us to do over at Altered Book Lover, and in simplistic terms, it is an AB. 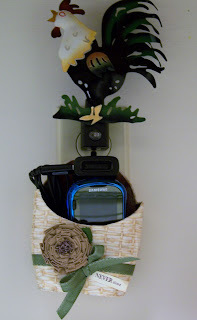 This is my version, I used a basket weave paper ( not because it's Easter ) but because I have a rooster/chicken theme kitchen and that's where I hang my charger up. See...right under that rooster night light! Now I am going to make another one cause this one is a little too small! It works but it take some maneuvering to get it all in there, but I LOVE the no cords!! 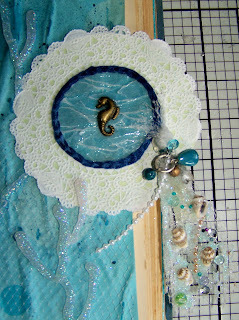 Then the last project isn't 'pinned' inspired. 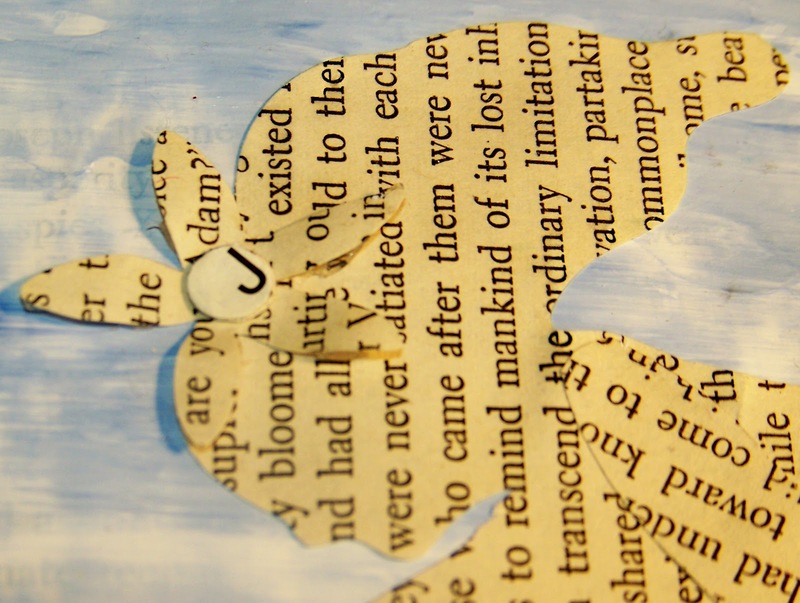 It kinda comes from doing the AB, and I have all these pages from the book sitting around so I thought I would mod podge this little cutie and sit him out in my "flower garden". He originally was a Christmas ornament that I was going to get rid of but I think she now has a new life on my porch. 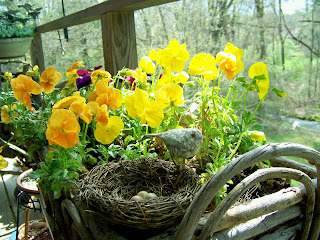 This is the planter it sits in, and those pansies are left over from last year!! man, they are blooming like crazy!! 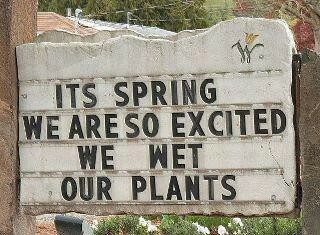 Usually I don't get 2 seasons from annuals but that shows you how mild a winter we had! 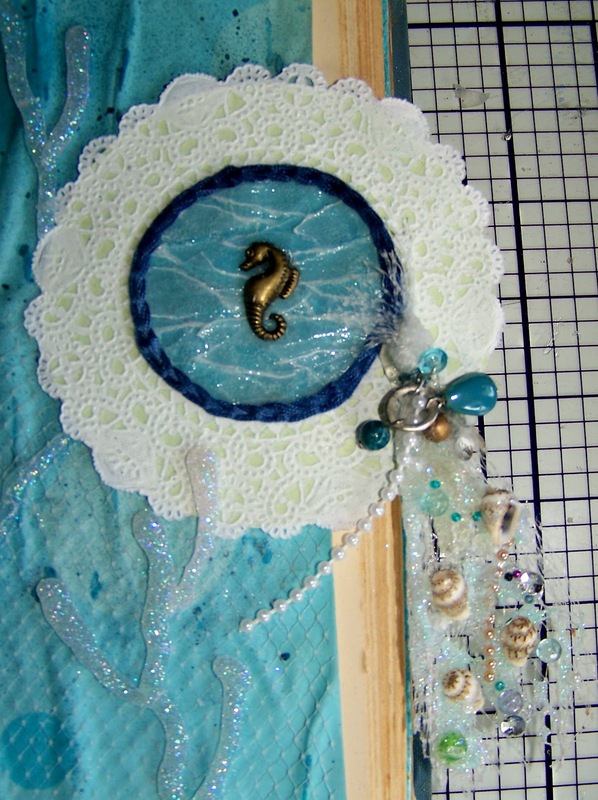 So if you pin, and made something from it, I would LOVE to see what you've done! 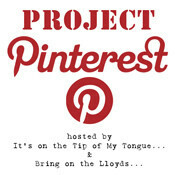 Please share a link to your project so everyone can visit too! 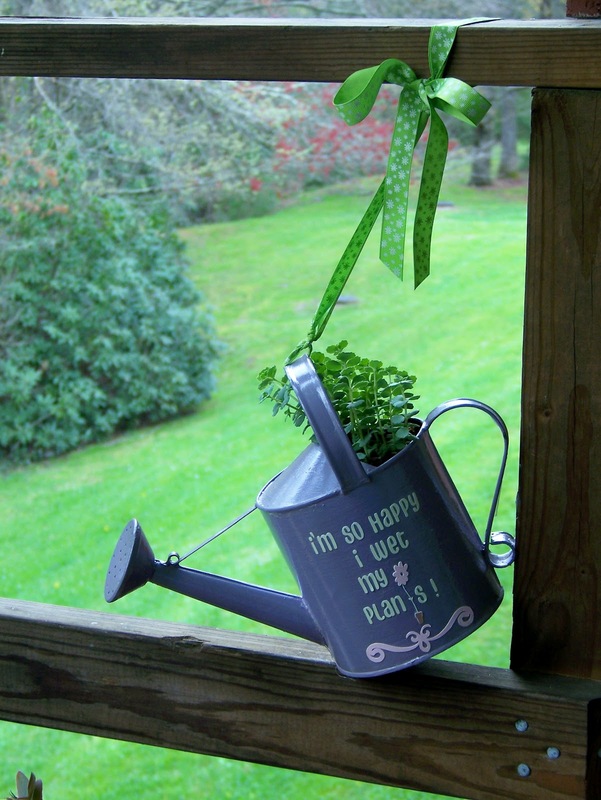 I thought about it for days trying to figure out a way to display my newly decorated watering can on my back porch and finally it dawned on me to use ribbon to suspend it from the railing so that it would appear tilted like it's in use. And I added a dab of hot glue for reinforcement to make sure it perched just so....lol I love this! 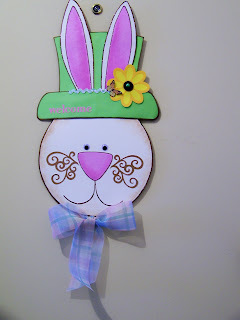 You can go to this post if you want to see how I made it or the Cricut cuts that I used! Look at him, he's looking right at ME! 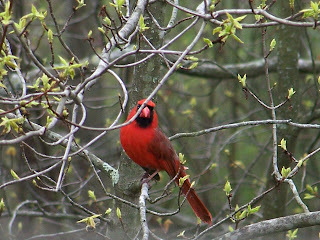 I swear he's laughing too while hiding behind that branch! I'll get you my little pretty! One day! We had a lot to accomplish for lesson #4, over at Altered Book Lover, but this was a fun assignment for me as I love playing with glue! 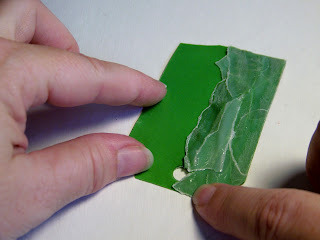 Find at least one way to use white glue as a major ingredient in a technique for a page you will either add to your AB, or on a page that is already in your AB. So I wanted to create some bottom of the sea elements, and truthfully this one looks a lot better in my head than it does in the book, but this is about experimenting and playing around. I took my white glue ( Aleenes Tacky Glue ) and 'drew' some fan coral on a piece of parchment and then sprinkled it with glitter. After it dried I put a layer of Ranger's Candy Crackle over it. 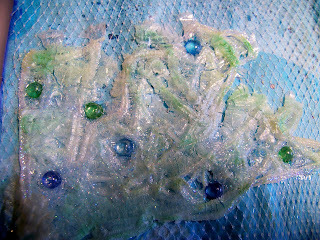 After that dried, I added the glass beads. Still not happy, I then inked it with green and blue...then I gave up and peeled it from the parchment and glued it down onto the vellum paper...sigh...It's actually very pliable too, I tested to make sure it wasn't going to fall apart and bent it and moved it all about just to be positive. 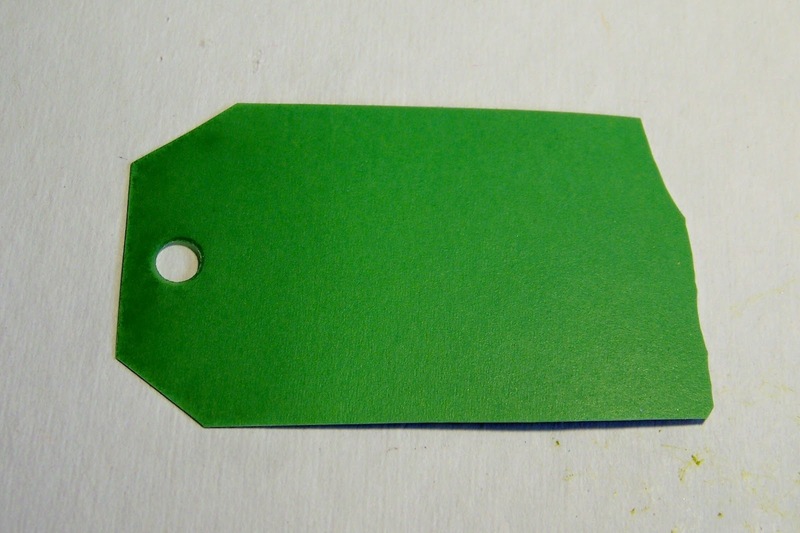 And the tag's 'tail' was a lot of fun to create. The mesh is from the super market, the clumps of glitter are hardened Candy Crackle from the inside lid of the jar, loose beads, shells, and the occasional sequin were thrown in too. The aqua beads dangling were from an old necklace of mine, long ago reallocated to the craft junk drawer, basically anything I could find to glue on I did. I have to say this one embellishment totally engrossed me! lol And another glue I want to mention is Helmars 450, that's what I used to hold all these lovely goodies in the mesh. 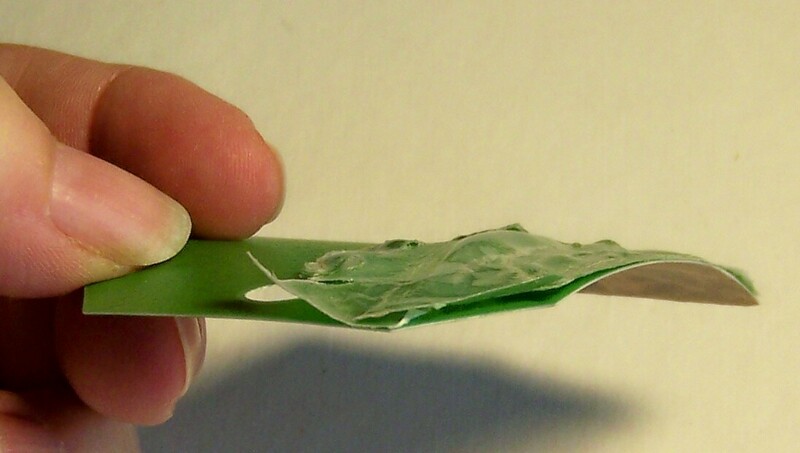 A wonderful glue that acts similar to a hot glue gun but you don't have to worry about burning your fingers! Bonus! 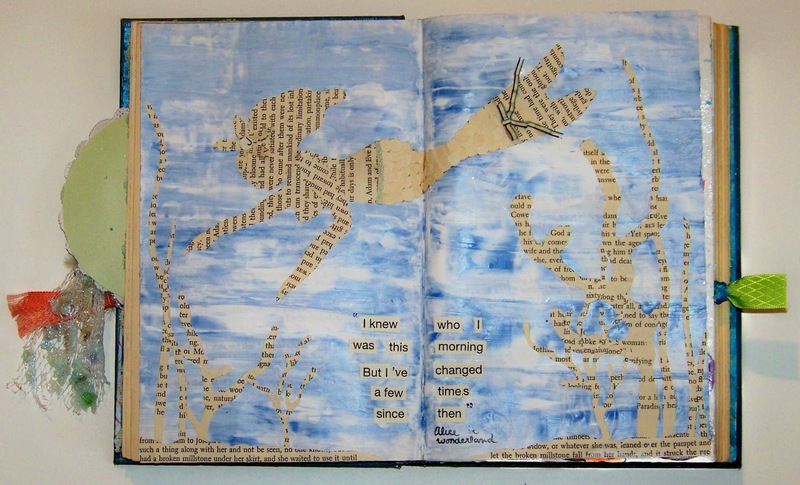 Go get your glue on and have fun, experiment, and create an altered book with us. We love to have you join us! Since I had a lot of questions and comments on this tag yesterday, I thought I would share with you how I created this pretty element. 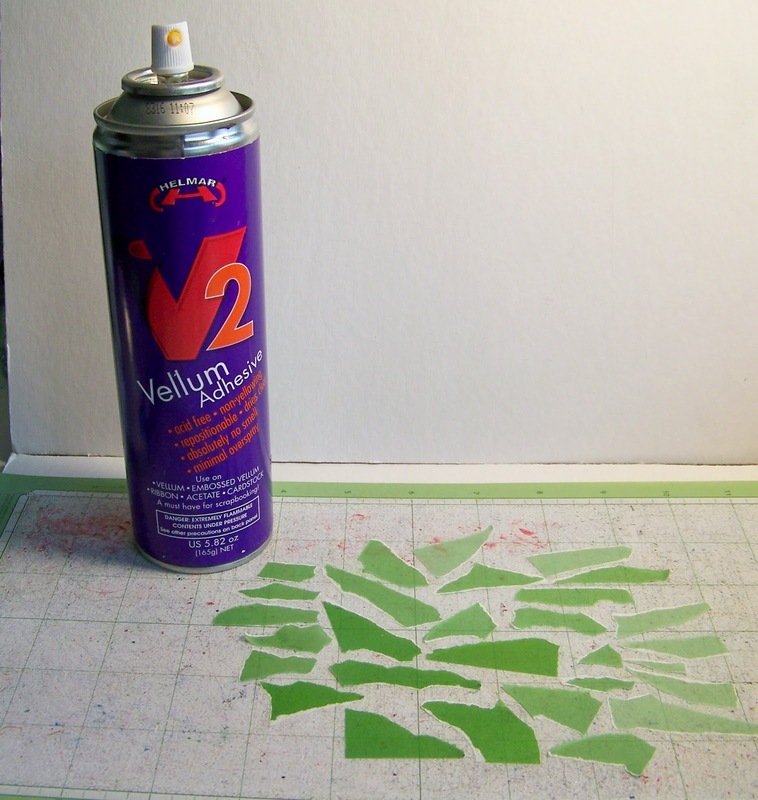 First off, I keep an old Cricut mat as my spraying board for the V2. Since it stays sticky from any over spray it does an awesome job holding down light weight pieces to be sprayed. So, first I cut my shape and sprayed it with the V2 and adhered it to the tag. 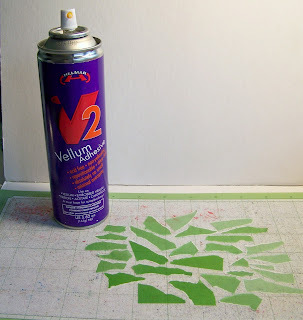 V2 is awesome as it will hold down your shape without making the vellum curl or warp. Next, tear strips of vellum. Keep in mind when tearing that your water strips all need to be horizontal so that it emulates the waves of the ocean. I laid all the strips upside down on the cricut mat and sprayed them. 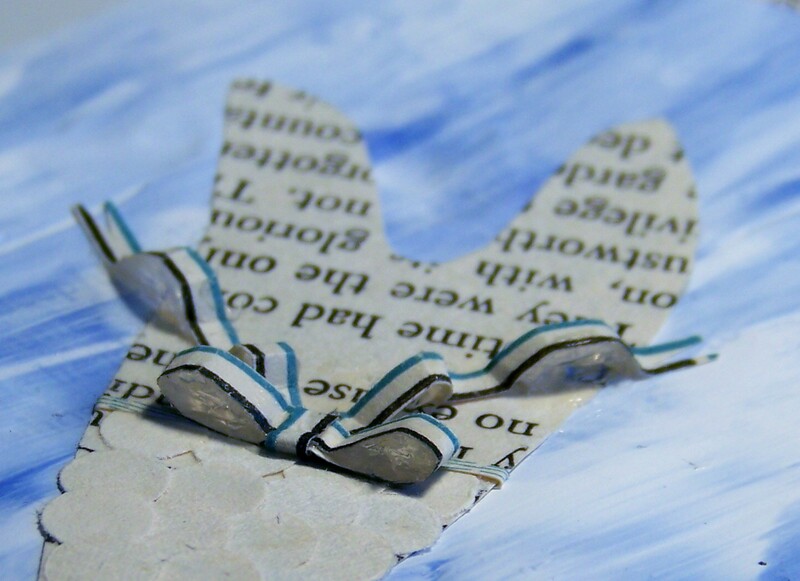 Then layered them onto the vellum shape. On the circle, I had to trim the edges to fit the circle shape, a rectangle is much easier to follow. After they are all assembled, I then layered the Candy Crackle on top. Now keep in mind that you will have to repeatedly check on your vellum while the crackle is drying since it is a heavy wet layer, the vellum will curl up dring this process. I simply wet the tip of my finger ( ok, so I lick it, ssshhhhh ) and press down any edges that curl up or lift away. And there you have it, trim it out as desired. If you have any questions, please feel free to ask and I will answer them as soon as I can. ( 9pm est ). Just go like the Helamr FB page and then you will get a reminder for the class! So last night poor Tracy was trying to paint and we were cracking jokes at her palm tree, and someone came up with "It looks like it could be a Walmart tree". All I can say is that Tracy is a good sport for putting up with us! 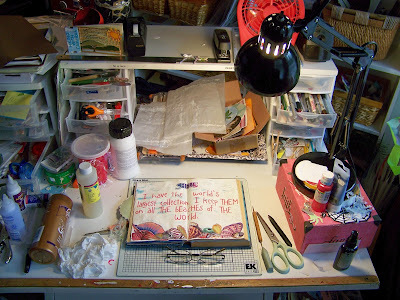 First I put a layer of gesso down on a piece of 6x12" cardboard, next crumpled a plastic bag and blotted it. Then used acrylic paints to create the background. I next used gesso again to paint the palm tree onto the background and once dried painted it in. The green paint is actually a glitter glaze that I gobbed on ( technical term ) to give it a dimensional look. Next I sprayed some mists on and let them run down the board. 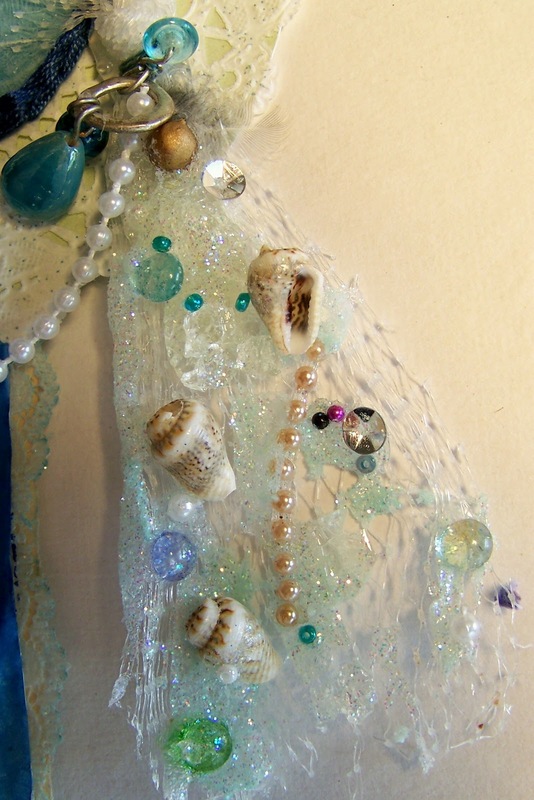 Then tore a piece of tan paper for my sandy beach and glued sea shells on using Helmars 450. I outlined and stickled, just cause I cannot help myself :) The writing is Tracy inspired, she did it on a project and I have used it a few times since then! Then I punch some holes in the top, run my Really reasonable Ribbon through them and knot. 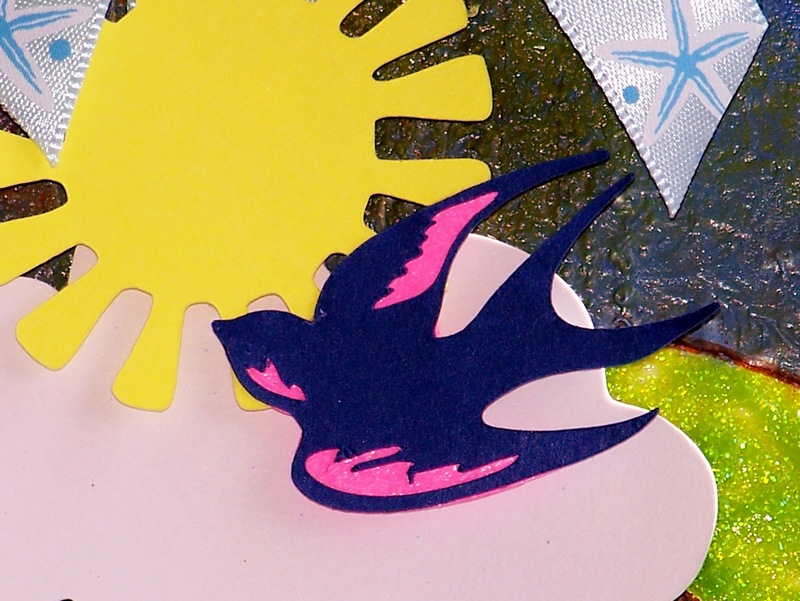 I also cut a cloud and sun ( Paper Dolls ) and the bird ( French Manor ) from my Cricut. Pop dotted them with Helmar Zap Dots. So from a a lot of giggles and laughter came a funky little 'Wally' inspired art. 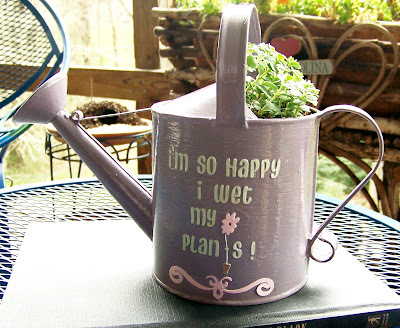 First I cleaned the watering can, then put 2 coats of gesso on it. 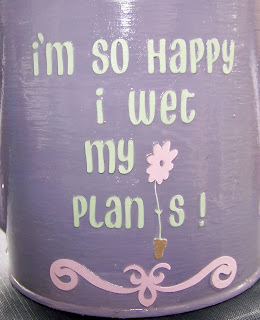 ( Using my succulent color palette from Pinterest ) I mixed up a dusky lavender and painted it with 2 coats of paint. 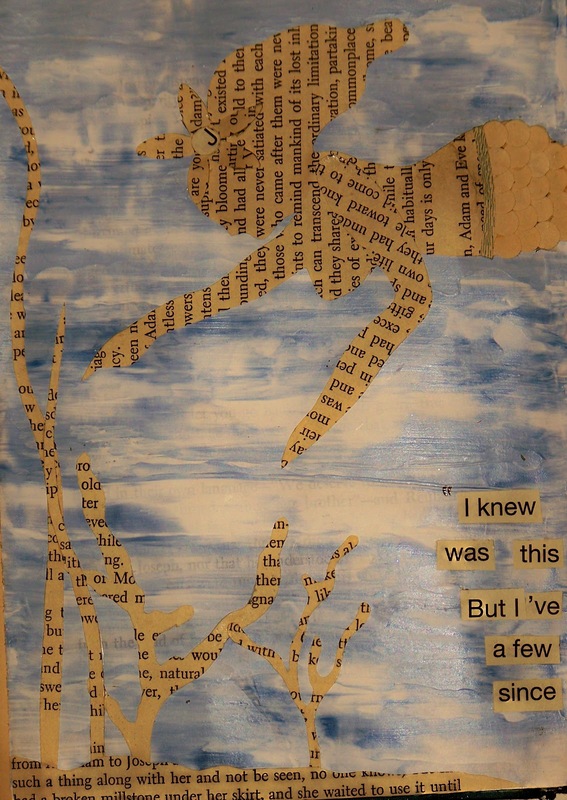 ( The saying was also taken from Pinterest, just tweaked a little ) Then cut my letters out from Don Jaun at 1/2", and my flower from Stretch Your Imagination at 2", and the flourish from French Manor at 2". 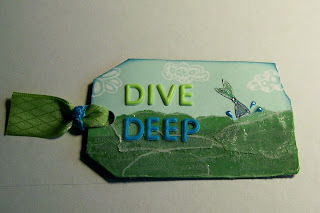 I then used a clear gloss enamel and stuck the letters on while it was still wet. Then went back and covered the letters and the entire watering can with the clear gloss enamel again. In hindsight ( I always notice things after I have taken a picture of them ) I would have moved the word 'plants' over to the left by one spacing so that the flower pot would have lined up with the middle of the flourish. 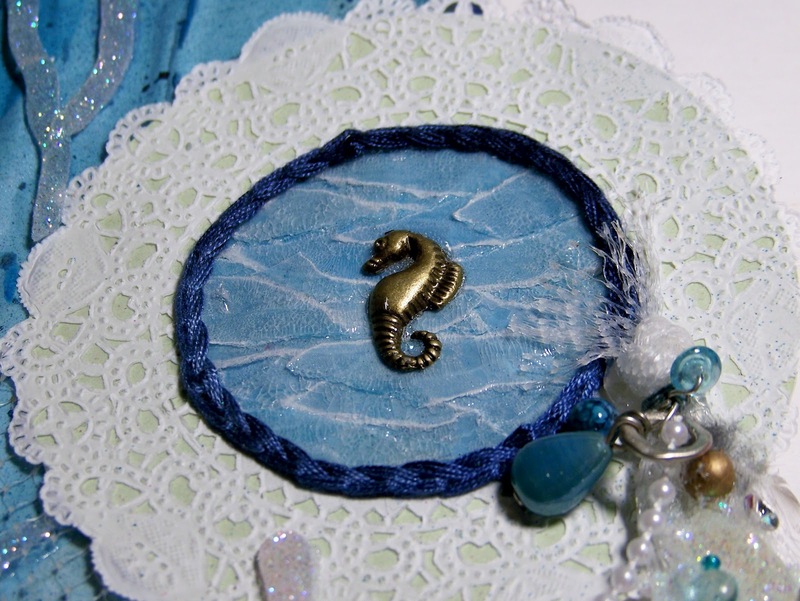 So here is another successful day of pinning and creating something from the pin. Better yet, have you made something from your pin? If you have, then Sarah, over at It's on the tip of my tongue, would love for you to post your project and then link it up there so everyone can see that endless hours of sitting on the couch and pinning really can be put to productive use! HA! Here is another Pinterest find...and a yummy one at that! 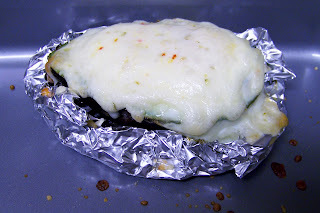 Now, just so you know I don't pin food recipes, I go ahead and head over to the link and put the link in a recipe file that I already had started. This one came from Life Hacker, for "Bake an Egg in an Avocado For a Fast and Healthy Breakfast Treat". That just sounded intriguing and I had to give it a whirl. The first try was almost disastrous as after following all the directions, my avocado tip over while putting it in the oven and the egg spilled out. Lesson 1 learned, avocados don't have flat bottoms! HA! Next try I made a little cup out of tin foil and placed the avocado in it and that has worked very well. Lesson 2, if you like a lot of avocado with your egg ( and I do ) don't use extra large size eggs, ( which is what I currently have in my fridge ) because the directions tell you to scoop out some avocado to make room for the egg, and being that I'm using extra large eggs, it means I waste some of the egg white that spills over the edges...oh well....lesson learned. I bake mine for 20 minutes, then turn off the oven and top with cheese. Then put back into the oven to melt. 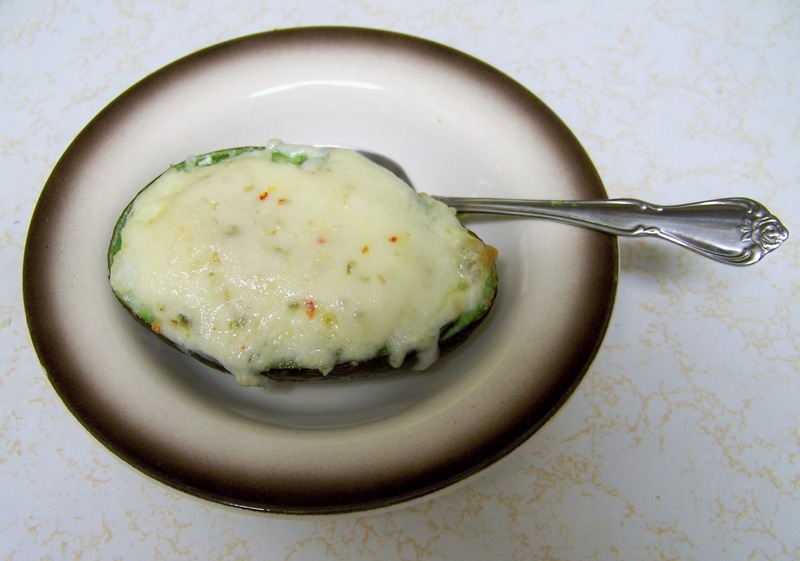 ( The picture above has little brown spots on the pans which are the bits of cheese that didn't make it to the avocado, lol ) So far I have use shredded Italian and Pepper Jack, and both have been very good too! So, have you made anything from Pinterest? If you have we would love to see what you made, what you thought of it, etc. 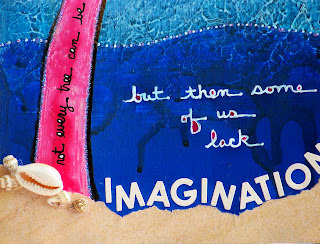 Sarah, over at It's on the tip of my tongue is asking everyone to show what they found over at Pinterest and to see what they made using that idea. So it's show and tell time ladies! I hope y'all have a wonderful week end and Happy St. Patricks Day to everyone!